And good advice for cologne, which men have a tendency to over-apply. 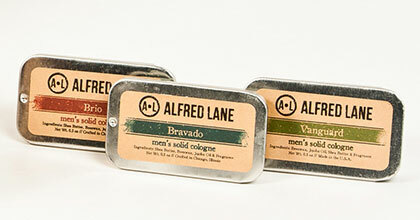 So keep it light and natural with the “solid” colognes from Chicago’s very own Alfred Lane, selling online now. Unlike spritz-ons, solid fragrances are easier to travel with. They last longer. And there’s less chance of fumigating passersby with your over-eager redolence. Alfred Lane’s made-in-Chicago scents forgo artificial chemicals for an all-natural blend of beeswax, shea butter and jojoba oil. Our favorite: the leather and tobacco Bravado. But there’s also the spicy sweet Vanguard and the woodsy bright Brio. Each scent is hand-poured into a handsome, inconspicuous tin. As for how to apply: solid colognes naturally pack less punch. This is a good thing. A small dab on the pulse points — the wrists, neck and back of the ears — is all you need.